Seemed very friendly on the phone. We didn't have a great deal of contact but when we did it was excellent. You had a good website that showed a large cabin alongside a creek, which was exactly what I was looking for. The creek and the porches were great. The interior of the house was spacious and clean. The game room in the basement was well used by all of us. The exterior could use some maintenance, but overall it was a great place. All the staff we talked to were very pleasant. We got a call from a team member after we checked in to see if every thing to our liking and to call if we needed anything. We thoroughly enjoyed our stay at Bear Haven. The property had everything we needed and then some. We arrived about an hour ahead of check-in time. We called the after hours number and were immediately told that the cabin was ready and we could go ahead and check in. We appreciated that. A well deserved get-away was needed. The Great Smoky Mountains was just the ticket. We hiked to the three falls in the Deep Creek area of the Great Smoky National Park. We enjoyed a ride on the Great Smoky Mountains Railroad through the Nantahala Gorge. We toured the beautiful Biltmore Mansion in Asheville. We visited the Oconaluftee Indian Village and the casino in Cherokee. Our favorite had to be the hot tub. Nice way to relax after a long day of hiking and visiting! What a fantastic place, beautiful cabin, and a perfect location! We spent the whole week exploring the beautiful countryside on our motorcycle and then came back to enjoy your little piece of paradise. What a wonderful way to spend our 20th wedding anniversary. The booking experience was quicker and easier than checking into most hotels. I called late in the afternoon, booked the cabin and was off the phone in under 10 minutes. Staff was friendly and responsive to all our needs. We had an amazing visit here. The views are spectacular. The house was gorgeous. Thank you for having us. Thank you. We loved the Cabin. Take the train ride and the go rafting. Everyone was courteous. We enjoyed our cabin view and location. Beds were very comfortable. Everyone was pleasant and very knowledgeable about the properties we were interested in renting. They made it easy and the communications on directions, etc. were great. 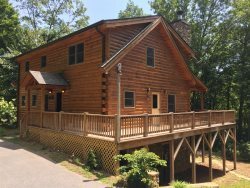 Thank you for allowing us to enjoy the Smokey Mountains with the pleasure of staying in such a beautiful cabin! We so enjoyed morning coffee on the porch, fires in the fire pit, amazing views and the beauty of our surroundings. You have done an amazing job with this cabin and we felt incredibly welcome. calls and emails answered promptly. No other experience. Your staff were very friendly and helpful. They called to ensure we made it to the property safely and on time. The directions to access the cabin were also very detailed and effective. Without those directions, we would have been lost.